How do music labels make money anymore? No one buys anything; everything is free, with a short pre-roll ad. As confident as music executives (and artists) are that streaming can turn the languishing music industry around, the pace has been slow, as people are reticent to spend $10 every month on an all-you-can-eat music subscription. On the flip side, messaging apps are blossoming, with VCs and big corporations throwing money at the problem to get users to engage with brands. These brands encompass a new breed of advertising, where machine learning imitate real people in channels — the same channels where users spend hours sharing ideas, stories, photos, videos and, of course, music tracks. 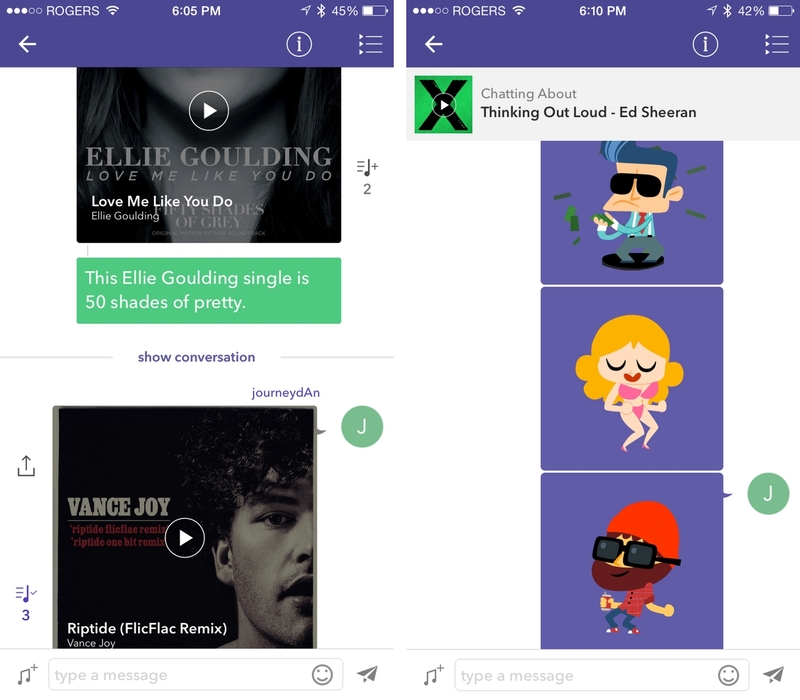 Enter Rithm, a Toronto startup with the brilliant idea of melding music sharing and messaging. 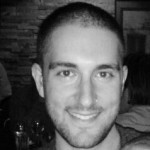 Only Rithm doesn’t want to wait years to build an audience of free users that generate little to no revenue. See, despite the fact that no one buys anything, music isn’t free to stream. That much is clear. 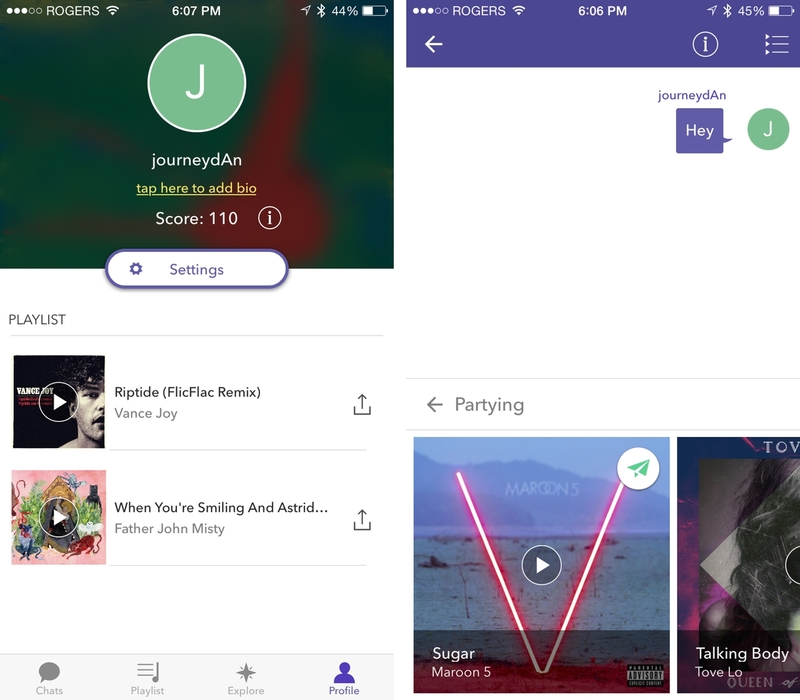 Rithm has a fairly simple value proposition: users can engage with one another, both privately or in public channels, to share songs and the emotions they evince. Non-paying customers can access an enormous library of tracks from the three major labels – Universal, Warner Music Group, and Sony Music – in 30-second chunks; subscribers to the $3.99/month premium tier can listen to entire tracks, once they’re shared. That’s the beauty of Rithm, and the relatively generous pricing model endorsed by the labels. Unlike other streaming music services like Pandora, where users pay less but can’t control which songs they listen to, and Rdio or Spotify, which is more expensive but fully a la carte, Rithm is both cheap and track-specific. And according to co-founder and CEO, Mike Wagman, it is the best of both worlds. “This is the first time the labels have tried something like this,” he tells me prior to the app’s launch on Thursday. Previously, Rithm sourced its tracks from sharing-friendly APIs like Soundcloud, but he found that the quality was often poor, or based on remixes. Wagman refers to the new version of Rithm as having a high degree of “stickiness,” a term founders love to use when describing the growth trajectory for their products. That’s because he knows that the messaging ecosystem is saturated beyond recognition, with big players like Facebook (Messenger, WhatsApp), Google (Hangouts, YouTube), Rakuten (Viber), Snapchat, Kik and others taking steps to keep users in their windows longer. It is by focusing on music sharing, and access to the major labels’ entire catalogue, legally, that Wagman feels Rithm will find traction. Unlike Spotify or Rdio, tracks can only be added to a playlist once they are shared — sent or received — so the experience is extremely curated. Wagman points out that music discovery, even in big apps like Spotify or Rdio, is fundamentally flawed, with the surfeit of choice making it difficult to find the best tracks to listen to. But everyone, he says, has that one friend that knows all the good songs in a given genre, or the best tracks that flow into one another. Users can glean tracks via category, by dragging them into the chat stream, or by explicitly searching for them. This is foremost a millennial-friendly product: there are no albums, just tracks, loaded in a stream along with specialized dancing emoji to accompany the perfect feeling with the perfect track. There’s nothing particularly innovative about wanting to share music with one’s friends, but Rithm succeeds in its simplicity. The issue here is whether it wants to be a chat frontend, which means convincing people to spend time in a separate screen to Kik, Snapchat or WhatsApp, or whether it wants to be the platform that provides this kind of access to companies like Kik, Snapchat or WhatsApp. Considering the app is aimed at a particular audience, its success has a lot to do with the names it can attract. Like Kik, Rithm is launching with a number of brand partners like Elite Daily and Much, as well as artist partners such as Steve Aoki and Migos. Branded emoji, such as a cartoon Aoki jumping up in slow motion, cost $1.19 CAD, and there are a couple dozen to choose from. The melding of music, chat and bespoke animated emoji may not seem like enough to bolster usage, but the tracks are the point here. No one buys things, and yet Rithm is betting that people will spend $3.99/month to listen to an unlimited number of high-quality tracks, and a few more bucks on their favourite artists dancing to the beat. All of this wrapped in a pretty, functional frontend that is available on both iOS and Android. Oh, and the full music catalogue is available in both the U.S. and Canada.